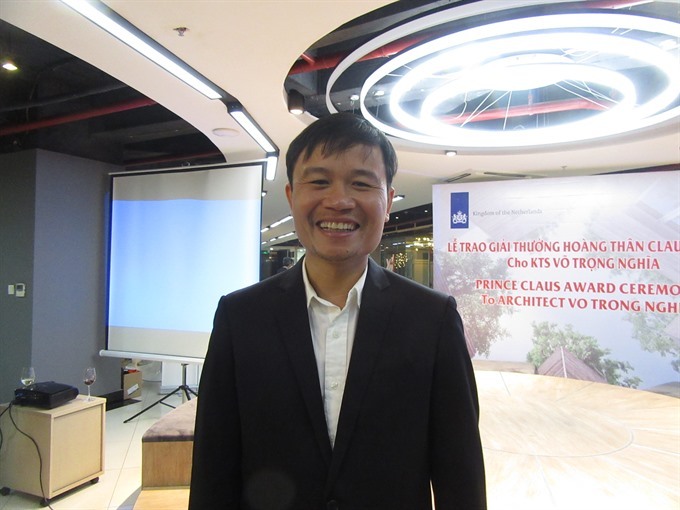 Vietnamese architect Võ Trọng Nghĩa was awarded the 2016 Prince Claus Award by the Embassy of the Netherlands to honour his contributions to Việt Nam’s urban planning with a focus on sustainable architecture. The 40-year-old architect is well-known in Việt Nam and in the world for his environmentally friendly architecture, and ability to balance culture and nature. He spoke to Bạch Liên about his work. Could you share with me the significance of this award to your career? The award is very important to my career. However, it is not only for me. I hope it can inspire other people to use green architecture and to grow more green trees in Hà Nội and HCM City. That’s my biggest hope. Hà Nội and HCM City are mega cities. More than 10 million live in each. They have been heavily affected by air pollution, traffic jams. There are not enough green trees. Inhabitants living in those two cities are stressed. That’s why I believe we have to contribute to making the cities green. People should live closer to nature so they will feel much happier. I do hope that this award will help people be more aware of the importance of living near nature. Your designs range from large urban structures to durable, inexpensive housing for remote communities. What is your favourite green work until now? The work entitled “Houses for Trees” is one of the works I am most satisfied with. “Houses for Trees” is a prototypical house within a tight budget of US$155,000. The project’s aim is to return green spaces into the city, planting big tropical trees on high-density dwellings. Thick layers of soil will cover the bottom of concrete "pots", which, once planted will also function as storm-water basins for detention and retention, thus reducing the risk of flooding in the city when implemented on top of a large number of houses in the future. One such dwelling is located in Tân Bình District, one of the most densely populated residential areas in HCM City, where only 0.25 per cent of the area is covered in greenery. This “House for Trees” has already welcomed several people who were severely depressed. Since living there, they have felt much better. Even though they are still a little emotional, they have become much healthier. It was a miracle. Did you face difficulties pursuing your career in green architecture? Yes, I encountered many difficulties at the beginning. My “green” works look a bit strange and different than other works that people often see. So at the beginning, almost no one accepted my project. But after one green building was built, and then another, many people are happy about them. Now my work has become much easier with the support of many people. How should Việt Nam make its cities greener? I believe that local authorities should think of policies to encourage more people to build green houses with green roofs. If local authorities can do it, they will not have to grow thousands of trees, the inhabitants will do so. When each family builds a green roof, the city can be turned into a park. The cost for building a green roof is very low. You only have to pay VND500,000 (US$22) to waterproof 1 square metre of the roof. One square metre of green roof will cost, in all, VNĐ8-10 million. I hope that one day, authorities will decide that all newly built houses or restored houses must have a green terrace or rooftop. Thanks to the Prince Claus Awards, your favourite green project will be funded. Could you tell about it? I am thinking about urban agriculture. I will try to create an agricultural system around an office building in a big city of Việt Nam. The staff working in the office building will enjoy the green surroundings and also eat clean vegetables three times a day.